SchoolShooting.org is a new service, just launched, by Washington Ceasefire, which is a non-profit organization that seeks to reduce gun violence mainly with a focus on Washington State. The new website was launched to commemorate the 10th anniversary of the Columbine shooting in the hope that it will spread awareness about gun violence in schools, not just in Colorado and Washington, but on a nationwide basis. Integral to the new website is a Google Maps mash-up displaying the 291 school shootings that have occurred since 1992. 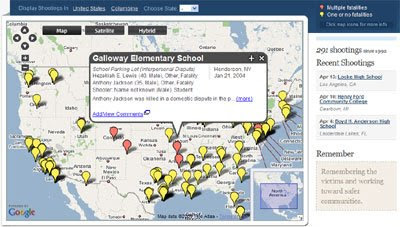 The foundational database was contributed by the National School Safety Center, but it has subsequently been enhanced by SchoolShooting.org and the site provides a form for users to submit data on a school shooting not already mapped.